What would be really cool, though, is if he had some kind of logo or decal from every company. But you can’t just hang around waiting for a Bugatti badge to shake loose from a passing Chiron. So what do you do? You write a letter to every car company and see what happens. Patch’s mom, Lindsay, helped him put together a simple pitch to send out, explaining himself and his mission: He loves watching cars go past his house, and one of them shed a badge that he found. Which was awesome, so if you have any more logos or decals kicking around, he would love to have one. They included a coin from his piggy bank and, when they could, a photo of him standing in front of one of that company’s cars. He signed each letter. They sent them out, to more than 50 companies—even to ones that don’t exist anymore, like Saturn. Then they waited. Soon, the responses started rolling in. Volvo sent a huge grille badge, a frisbee, and a lot of other goodies. Jeep apologized for having no badges but sent a metal sign, a hat, a pen, and a keychain. Bentley sent the center cap from a wheel. BMW wrote, “It’s great that you enjoy watching Ultimate Driving Machines® cruise past your house and we are happy to send you the enclosed shiny, new BMW emblem to add to your collection.” And so it went, with Tesla, Bugatti, Honda, and many more. Lincoln sent an original pencil sketch of a Continental. Almost all of them returned the coin. Even some of the companies that don’t sell cars here anymore tried to do something. Suzuki noted that it stopped selling cars in the U.S. in 2014, but they still sent a key ring, stickers, and brochures for their motorcycles and ATVs. Isuzu explained that they got out of the car game in 2008, but they sell commercial trucks, so they sent him a couple Hot Wheels–size models of those. 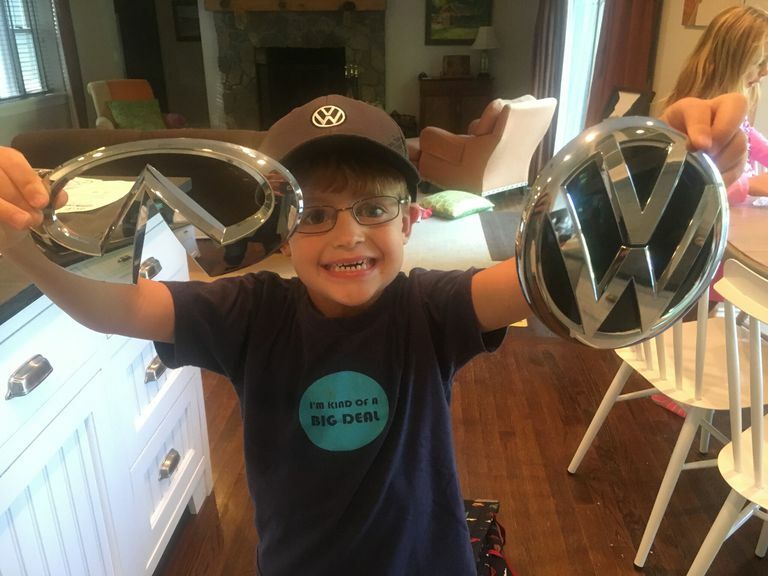 Even for an enthusiastic kid with encouraging parents, the near-uniform response is a happy surprise—after all, nobody has a “Department for Letters from Kids Asking for Logos or Badges from the Factory Floor.” Yet somehow most of these letters found their way to people who wanted to help. Given the prevailing narrative that kids are getting their driver’s licenses later and later, that they don’t care about cars anymore, it’s probably really nice to hear from someone who’s five (now six) and loves anything with wheels.